UPDATE: Google will shutdown Google+ in 2019. But Google My Business continues to grow and delivery huge value for brands. Check out our guide to using the social network here. In the last few years the network has undergone some major updates—including the way it helps businesses connect with customers and prospects. This guide will give you a quick primer on everything you need to know about Google Plus and how to put it to work for your brand. If you’re hoping to make your company more discoverable (and easy to locate geographically) Google has handed you the tools you need on a silver platter. As a study from Optify tells us, it pays to be at the top. Websites that appear on the first page of Google get 54.8 percent of all clicks from users. The lesson? It pays to sign up for Google My Business and optimize it for your target audience. Google Plus accounts are no longer required for customers to leave reviews. That means anyone that does business with you can share their experience. You can use business reviews as a way to get more credibility, increase your organic search ranking, and influence potential buyers to check you out over the competition. In addition to Google Plus, you have a ton of other Google resources at your disposal—Communities, YouTube, Gmail, Google Maps, Hangouts, AdWords—all intended to help you maximize your marketing strategy. By strategically organizing your connections on Google Plus, you can segment key audiences and share relevant content. It’s a great opportunity to get +1s, reshares, and replies. A study conducted by Hubspot showed that sites using the +1 button get 3.5 times more visits on Google Plus. This is a great opportunity for you to join the discussion or get engagement on your own content. If you haven’t set up your Google Plus account (or can’t remember if you created one), hold tight. We’ll show you how to build one from scratch or migrate your existing business Page over to Google My Business. First, you need a Google My Business account. Once it’s set up, you automatically have access to a Google Plus for business page. 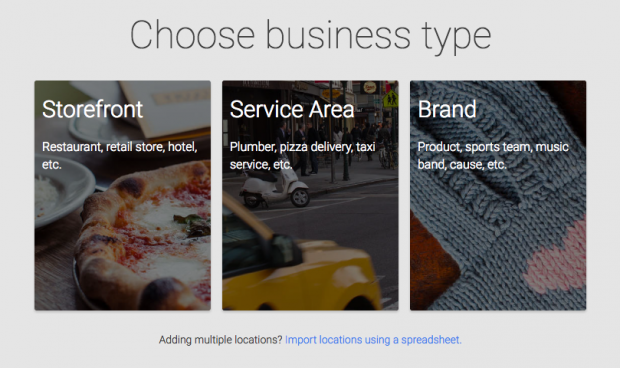 If you own multiple businesses in different locations, you need to set up a Google my Business account for each one of them as your business shows up in search based on location. Remember, you can always log in through Gmail to view your existing Google Plus Pages. Storefront: If you want people to physically come into your business and buy products, this option is for you. 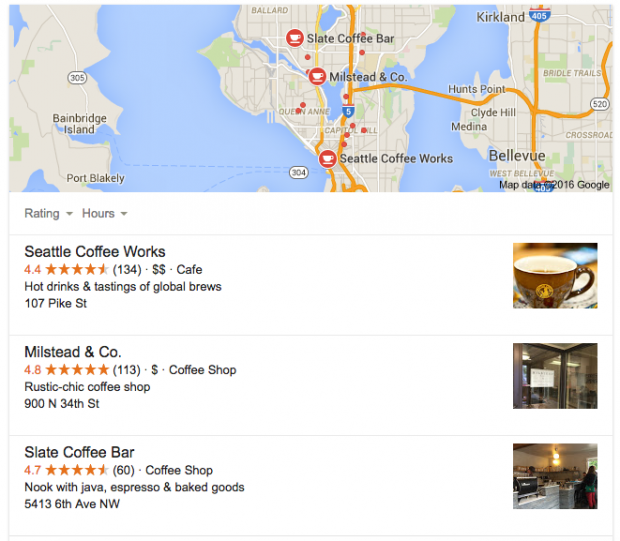 In search results, your Google Plus Page will show location, hours, or other contact info. Service Area: If you run a service location and you’d like people to be able to identify your proximity to them, choose this option. In search results, your Google Plus Page will show location, hours, or other contact info. Brand: If you want to engage and chat with customers or your business doesn’t operate out of a specific location, this option is for you. Your Google Plus Page won’t show location, hours, or other contact info. Give a visual taste of your brand. Businesses that add photos get 35 percent more clicks than those that don’t, and 42 percent more requests for driving directions. Double check that the information is correct. All of the information you provide needs to be 100 percent accurate. If you misspell your address or add the wrong hours, that can seriously damage the customer experience. Use relevant keywords in your description. Use simple, human language that includes relevant keywords that describe your business. Create a custom URL. A custom URL gives you a short, easily recognizable web address for your brand. Google offers tips on how to set one up. If you have trouble finding your page, Google’s support forum has an advanced list of steps. Type in your business name in the text box. This will show you all listings and indicate if you have any duplicate listings. For detailed instructions on how to remove old pages, you can follow these instructions. You can organize your People into different Circles, such as customers or influencers, which let you target your messaging to the right people. A fashion retailer, for example, might create a circle of fashion bloggers and then share updates on their seasonal lines with them. In November 2015, Google Plus was redesigned to make it easier for people to discover unique and interesting things related to their interests. The redesign focused the product on two major features, Collections and Communities. Collections allow you to follow and share around specific topics, so it’s easy to see updates related to just the things you’re into. Communities make it easy to connect with people who are interested in the same things you are. Recently, that new experience became the default for all Google Plus users. With the release of the new Google Plus API, it’s possible for anyone to post to Google Plus from Hootsuite— whether you’d like to post via a Google Plus page or profile. Schedule posts and manage your business’ Google Plus presence with Hootsuite. Try it free today. This is an updated version of a post originally published in July 2013. With files from Evan LePage.